The various habitats found throughout the Potters Creek subwatershed are rich in abundance and diversity. The Potter Creek subwatershed is located east of the Garden State Parkway and is comprised in large part by lands within Berkeley Township, although a very small portion of the subwatershed is Ocean Gate Borough. Both of these municipalities have dense residential development. Berkeley Township contains many lagoon developments in the subwatershed. Potter Creek itself is adjacent to a significant amount of protected land, including a 72-acre parcel of forested wetlands and salt marsh continuing across Bayview Avenue to Barnegat Bay, which the Trust for Public Land conserved and transferred to Berkeley Township in 1997. Potters Creek was the name of the town that is now known as Bayville. The area was widely utilized and known for cedar refining and production. Also, this subwatershed was known for its bog iron ore smelting and production. Other smaller waterways in the Potter Creek subwatershed are Sloop Creek, Maple Creek, and Clamming Creek (all in Berkeley Township). The various habitats found throughout the Potters Creek subwatershed are rich in abundance and diversity. 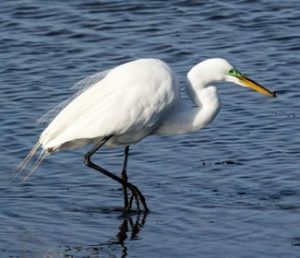 The tidal wetlands and marshes found where Potter Creek enters the Barnegat Bay are home to many species. Birds of prey, such as the osprey, and bald eagle, often frequent and inhabit the area. This area proves to be extremely important for migrating shorebirds and waterfowl. This area serves as a rest area along their winter migratory flyways. Whitetail deer, red fox, raccoons, and other species of native New Jersey mammals are abundant throughout this area. Locals have even recently spotted river otter along the banks of the Potter Creek! See a photo slideshow of the unique flora and fauna of the Potter Creek watershed created by the Potter Creek Crusaders.